This is the first run of necklaces created exclusively for Me by Moan's Couture NYC. 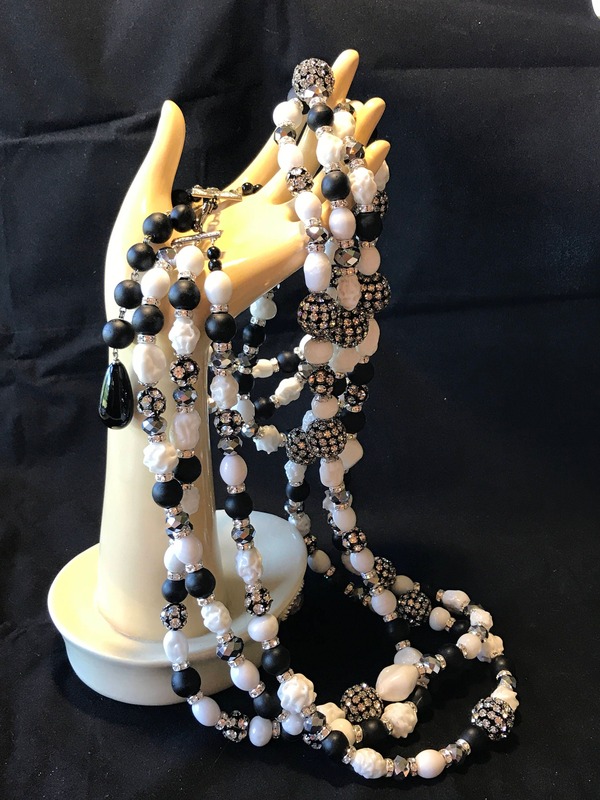 Th is necklace is a whopping 44 inches long with a 22 inch drop, the strands are 44,40 and 36 inches. 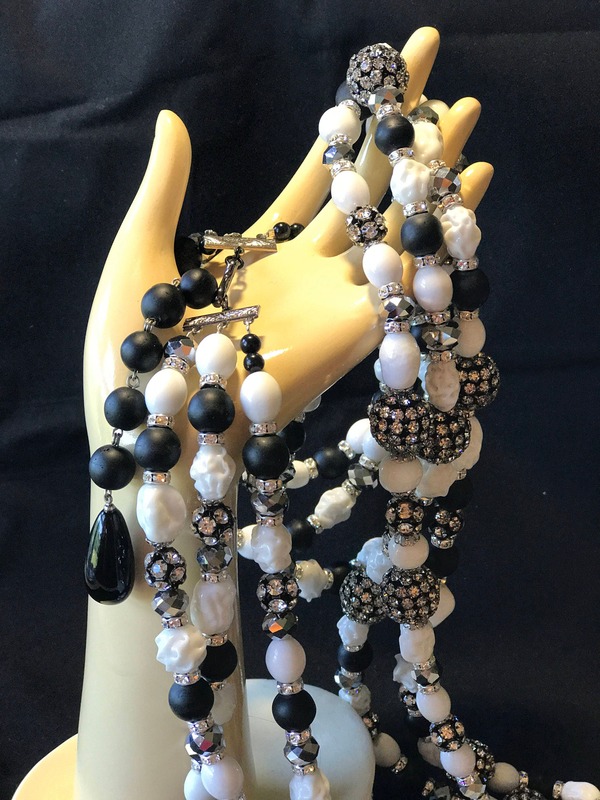 The necklace is composed of white art glass beads, black satin glass, and 3/4 inch large rhinestone beads. Photographs cannot even begin to display the scale and beauty of these incredible hand made pieces. MOANS collectibles are a blend of vintage and contemporary designs by designer Chris Crouch. The design for each piece is a blending of beautiful materials and expert construction. Collectible porcelain, vintage beads and glass cabochons, unique semi-precious are all enhanced by a backdrop of wire, brass and rhinestones. Creating a deep association to the past and present for the wearer. We all do it…Carelessly flip over a pretty piece of costume jewelry and inspect the finish work underneath. But that’s not all; we’re also looking for the designer’s label. Who made it is just as important as what it looks like. With Moans Couture, the irony is that something so small, like a name stamp, could mean something so grand. Moans Couture jewelry pieces are works of art — wearable art produced in limited quantities. Made in the USA, inspired by the magic of New York City, each piece envisioned and created by the designer, Christopher Crouch, whose friends call him “Chris”. New York City is like a compass, guiding aspirational individuals to their destiny. That sentiment may be cliche, but it’s true for Chris. He arrived in 1989. Handsome, blonde, nineteen years old, standing six-foot four-inches tall. Naturally, he dabbled in modeling for a time. But, having attending culinary school in his native Oregon, Chris began working in restaurants and taking side jobs in catering. Born with an entrepreneurial spirit, parlayed his talent for organizing delicious feasts into his own catering business. Hungry for new experiences, he accepted a job in purchasing at the advertising giant OGILVY & MATHER. Soon, he was recruited by the FORD FOUNDATION. While there, he attended night school at NYU. Feeling restless and unfulfilled he left the non-profit to blaze a new trail toward the career he always wanted - jewelry. Chris began his jewelry career in 2001 at CYMA Watches and Sequoia Jewelry, where he obtained first-rate knowledge and experience in jewelry merchandising. Mentored by Hugh G. Glenn, a world class jewelry businessman, and Yves Kamioner, a third generation Belgian jeweler, his earliest impressions of the business were influenced by leaders of the industry. Yet, the no-nonsense world of wholesale watches, gold, and diamonds left his creativity stifled. 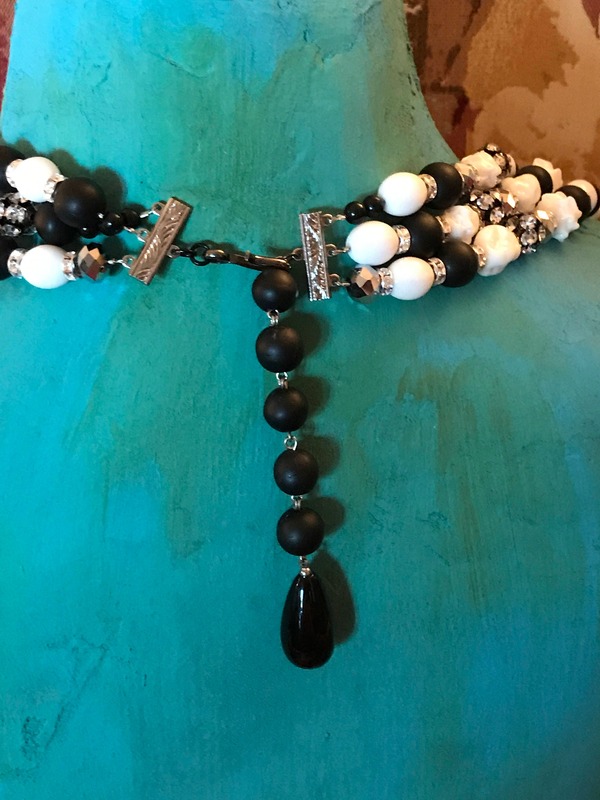 When an opportunity to work with an iconic costume jewelry designer presented itself, he jumped at it. A chance introduction in 2006 to Lawrence Vrba led to a trial work period in the famous designer’s Fifth Avenue studio. Chris was told prior to starting that if he weren’t able to produce jewelry to Vrba’s very high standards within two weeks, he would be let go. Exceeding Vrba’s expectations, Chris spent the next 8 years as senior assistant to the iconic jewelry designer. Finally, under the keen eye’s of a master, Chris found a home to flourish as an artist. By 2009, the working relationship with Lawrence Vrba warmed into a close friendship. Vrba encouraged Chris to start selling his own pieces on the side while still working full time at Lawrence Vrba’s studio. Vrba, half joking, suggested he call the line Moans Couture, named after Chris’s drag persona, Farrah Moans. The name stuck! During his apprenticeship, Chris built pieces sold under the award winning Lawrence Vrba label for celebrities (such as Beyonce and Katy Perry). Other notable clients include: the Broadway productions of Hairspray, Wicked,Exit the King, Chicago, Thoroughly Modern Millie, Anything Goes, and various items for The Metropolitan Opera. The fashion world requested pieces from Vrba’s studio for Zac Posen’s 2013 Resort Wear runway show, and Chris was there to build the pieces. The annually televised Victoria’s Secret Fashion Show began as a project where Chris made pieces for Vrba. As the years have passed, Chris has increasingly been credited under his own label for select Moans Couture pieces worn by some of the most beautiful models in the world. Through his pedigreed apprenticeship and peerless experience in Vrba’s studio, Chris absorbed the skills and techniques that inform his design vision today. In 2013, Chris grew more established as a designer and free lance jewelry maker in NYC. Notable credits include making the jewelry for the hit Broadway production of ALADDIN, working on jewels with the HBO series GAME OF THRONES, the off Broadway burlesque spectacular “Queen of the Night”, and the 2014 Katy Perry “Prismatic” Tour. As he matured artistically, Chris was fueled by his omnipresent desire to do and achieve more. He officially launched his own line in the fall of 2013, with Vrba encouraging and supporting him all the way. Chris’s style celebrates the tradition of massive, solidly built statement jewelry. And has already gained a considerable following. The design philosophy is simple: He makes jewelry for himself; jewelry that makes him happy. Soldering jubilation into each piece, Chris believes the joy embedded into every bauble will shine through on whomever wears it. That perspective is good for business, too. 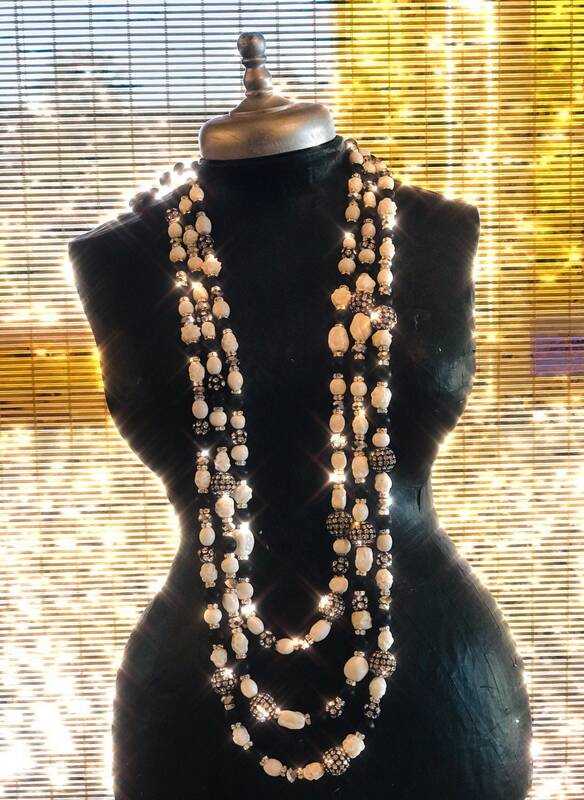 Moans Couture pieces are sold by high-end costume jewelry dealers like BAKELITE QUEEN all over the world. As far as Moscow, romantic as Paris, and luxurious as Palm Beach; Moans Couture pieces are represented every day in exotic locations somewhere on the globe.